It was grocery store day, because I didn’t have much left from all of my cooking endeavors last week, BUT I did have avocado and eggs, so why not put them together?! I had seen someone recently do this and wanted to try it. No regrets peeps. No regrets. 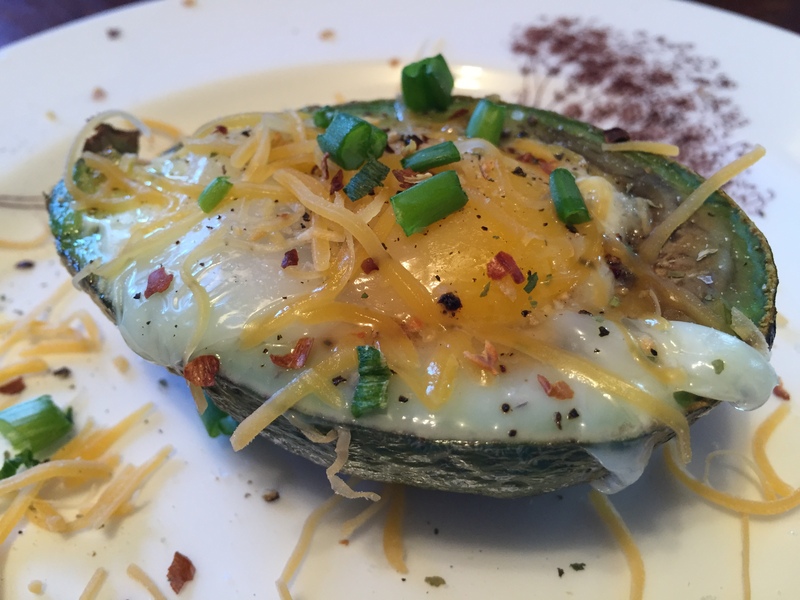 I think the key to this recipe is getting an avocado that can hold the egg. If the egg slips and breaks, it can be a real mess, so get a good sized avocado. So, make today your grocery store day!! Place each avocado half in a ramekin. Crack 1 egg into each avocado half; season with salt, black pepper, and cayenne pepper or whatever else you can think of! Bake in the preheated oven until entire egg is cooked through, about 15 minutes. Sprinkle each avocado with whatever your heart desires! I used garlic salt and pepper, red pepper flakes, chives and 2% cheese.